Dinner With Your Dog Supports The Shakespeare Animal Fund! Dine alfresco with that special pooch on our Riverside patio! When you dine with your dog on Mondays in September, 10% of the check will be donated to the Shakespeare Animal Fund. 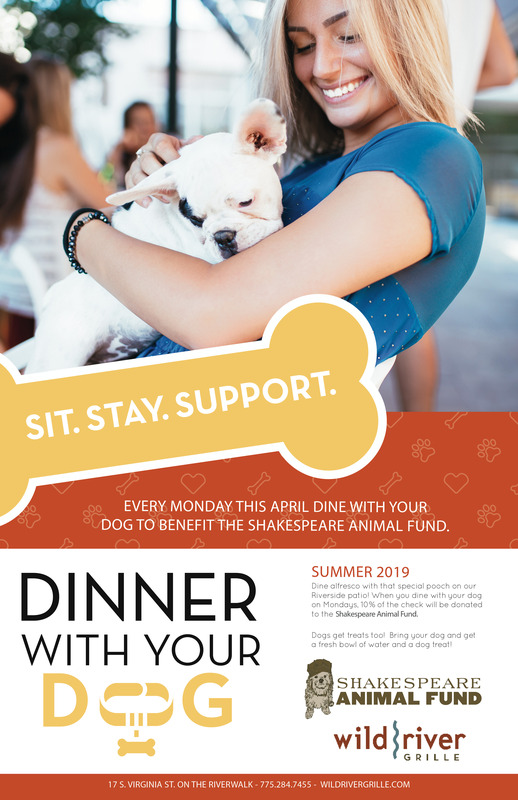 Bring your best friend for Dinner on our outdoor patio every Monday during the month of April and Wild River Grille will donate 10% from every entree to the Shakespeare Animal Fund. Located at the Wild River Grille along the Riverwalk District in Downtown Reno. 501© (3) charity, and local no-kill animal shelter. Shakespeare Animal Fund is a non-profit organization whose sole purpose is to save lives by paying emergency veterinary bills for elderly, disabled, returning veterans and others whose dogs and cats are suffering and dying and they haven't the funds to help. There are thousands of local people who live alone, below the poverty line, and whose main "family" is their pet. They will do without medicine, food and other necessities to try to help their pet, and that's where Shakespeare Animal Fund steps in. Founded in January 2004 under the direction of the Community Foundation, this organization has raised more than $500,000 to help local animals, but the need continuously grows; they get an average of 500 calls and emails each month begging for help. Injuries and illnesses include everything from animals who have porcupine quills in their bodies, are hit by cares, attacked by wild animals, burned in house fires, shot, puppies with Parvovirus, animals with cancer, blockages and many other painful and life-threatening issues. Dogs get treats too! Bring your dog and get a fresh bowl of water and a dog treat! Help the community and enjoy a great meal by participating in the Dinner with Your Dog event. For more information contact Valerie at Wild River Grille, (775) 284-7455. And to learn more about The Shakespeare Animal Fund go to www.shakespeareanimalfund.org.